You can be Sofia and Rosie!! Sofia and Rosie are two young clelebrity girls who Ellen DeGeneres has brought to fame on her show spotlighting their singing, dancing and adorable personalities. 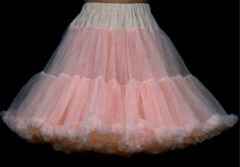 Why not grab a girlfriend this year, put on a leotard and one of these crinoline “tu-tu’s”, grab a microphone and be set!! Everybody loves Sofia and Rosie, so you too can be loved by everyone!